As one of the perks of being in anesthesiology, one of the most desirous and stable professions anywhere, I frequently get postcards advertising absolutely seductive job prospects in some exotic locations that I just must take a look at and move to. They frequently feature eye catching photography of happy and fun loving families, gorgeous scenery, and golf greens. But everybody in the field knows that the best jobs don't need to be advertised; they fill themselves automatically and quickly. So I always look at these solicitations with a gimlet eye. I try to read the meanings between the lines on the job descriptions and decipher their true intent. For instance, take this card I recently got in the mail. I'm sure virtually every member of the California Society of Anesthesiologists received one. Naturally it features the majestic Angel Falls in Yosemite National Park. Who wouldn't be drawn to that image? I know I wouldn't mind looking out the window of my house to look at that natural beauty every day. So they are saying the job is somewhere around Yosemite, which could be anywhere within a one hundred mile radius. Now let's look at the job opportunities they list. First, in bold highlight is "Partnership track". Funny they don't say in how many years. Does it take two years to become partner, or seven years, or only when a partner moves or dies? Hmm. That might be an important detail to know before joining their group. The next perk sounds pretty nice, $520,000 gross income guaranteed. Who could turn down a guaranteed income of half a million dollars? But notice it says gross, not net. So do you have to pay for your own health insurance, malpractice insurance, tail coverage, dental and vision, or billing fees? Does the group take a cut of that "gross income" to cover office expenses? How long is that amount guaranteed for? Is it like a teaser loan rate that's not guaranteed after the first year? Next, the card promises that you'll work out of one facility only. Why is that? Is it because the group is uncompetitive with other anesthesia groups in town and can only get a contract with one hospital? Is it because the hospital is in such a small town that it can only support one health care center? Curious minds want to know. I love the next line. In big, bold, black letters, "No Obstetrics or Gynecology." Like that is total anathema to anesthesiologists. Yes we all hate doing OB/GYN cases. Other cards I've seen showed similar distaste for neurosurgical cases and thoracic cases. They must think promoting the lack of these important surgical fields will draw better and more qualified anesthesiologists. Low volume of heart cases. It probably means that they have to helicopter their active MI patients to the nearest tertiary care hospital fifty miles away after you've been called in to intubate and stabilize the patient. Orthopedic cases most prevalent. So most of their cases are agricultural injuries, motor vehicle accidents, or elderly hip fractures. What does a friendly call schedule mean? Does that mean operating room staff say hello to you at 2:00 AM when you're in there doing an open compound fracture of the ankle and femur? I'm not at the hospital to make friends with the call schedule. And, finally, I can get all this with less work hours than the average anesthesiologist? So they are trying to entice me with getting more for less? Well golly gee, where do I sign up? An alarm bell is going off in my head that's warning me against promises that are too good to be true. Work fewer hours and make more money? Does the anesthesia group own the rights to an oil well under the hospital? The postcard's description of the local community helps to pinpoint the location of the anesthesia group. First they say they have easy access to both mountains and oceans. That would be easy: Los Angeles. But it can't be L.A. because there is a picture of Yosemite on the card. So that must mean it is somewhere in the Central Valley of California. Not a good start. Nothing against the good people of the Central Valley but having one of its major cities declare bankruptcy does not inspire confidence in the capabilities of its municipal employees to run an efficient organization. The rest of the card goes on to further confirm the job is in the Central Valley. Day trips to wineries, ie/ Napa Valley, or hiking and skiing in the mountains, ie/ Yosemite or Tahoe, places the northern Central Valley as the likely job location. 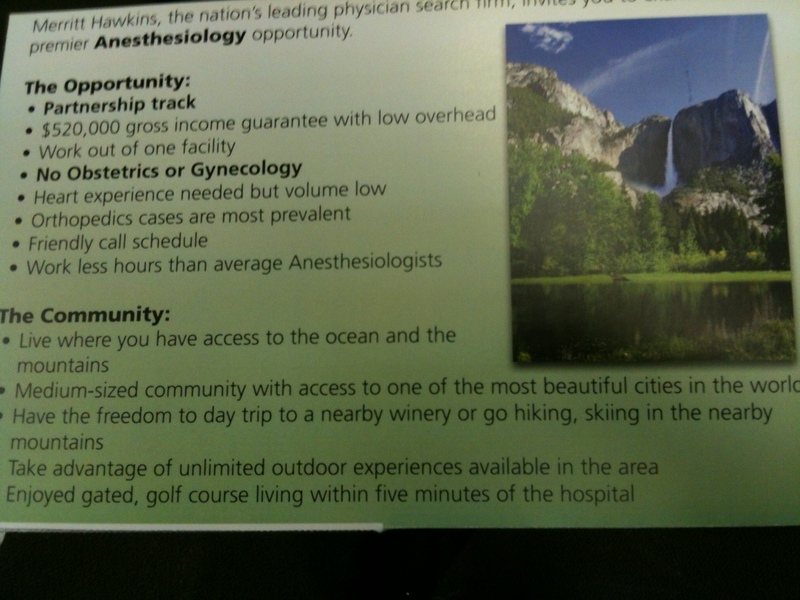 Lest you think you will be living in some sort of paradise with "unlimited outdoor experiences," the card tells you that you can live in a gated golfing community five minutes from the hospital. So the hospital is in a ghetto that requires you to live behind gates to feel safe? I think I'll pass. 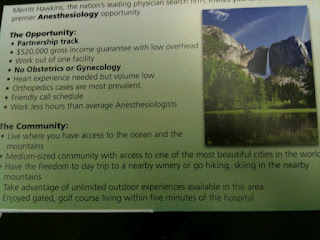 So for anesthesiologist who gets a cold call for a new job prospect, take a very cynical view of their touted benefits. Advertised perks aren't always what they seem. Like your father warned you, if it's too good to be true, it probably is. If you are still interested in the job after reading between the lines you better ask very penetrating questions during the interview. It will save you from having to move twice within twelve months. While likely different for hospital based anesthesia groups, typical private multispecialty groups in my area take 50 to 75% of total billing to cover overhead and expenses, leaving you with the rest. A clarification of gross income (is it gross as understood by IRS, or is it my share of practice billing?) is in order. An Educated Rebuttal To The New York Times. Are We On The Threshold Of Perfect Anesthesia?